Charlie Edwards says a domestic blockbuster with British rival Kal Yafai is “on the radar”, but he must first have to overcome former sparring partner Angel Moreno when he defends his WBC Flyweight World title for the first time at the Copper Box Arena this Saturday, live on Sky Sports in the UK and DAZN in the US. The 25-year-old stepped down a division to claim the WBC crown with a classy points win over Cristofer Rosales at The O2 in December and has already expressed his desire to become an “all-time British great” by winning World titles in multiple weight divisions. Edwards remains willing to settle his long-standing feud with 25-0 Yafai, who holds the WBA Super-Flyweight World title, although he has questioned whether the Birmingham man is willing to accept the fight. “He’s on the radar, 100 per cent,” said Edwards. “It could be next, because I would have it next, but I know he won’t, so it probably won’t be next. I don’t think he wants to entertain me at all. He made that pretty clear during the year when I was trying to call for the fight. “I’m focusing on my own path. These big fights will come now I have a World title and when they do I’ll be ready. I’m ready now to fight anyone and everyone. I’m ready to build a legacy, and have proper fights. To become a British great I’ll have to win World titles at multiple weights, and that’s exactly what I’ll do. 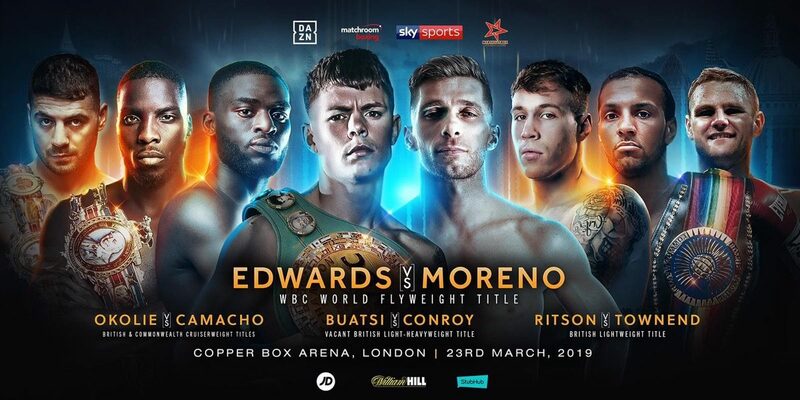 Angel Moreno has vowed to follow in the footsteps of his compatriots Kiko Martinez and Gabriel Campillo by becoming Spain’s next World Champion when he clashes with Charlie Edwards for the WBC Flyweight crown at London’s Copper Box Arena on March 23, live on Sky Sports in the UK and DAZN in the US. Spanish fighters have enjoyed recent success against Brits, with Bilbao’s Kerman Lejarraga blitzing Bradley Skeete in two rounds to claim the European Welterweight title before stopping Frankie Gavin in four rounds, and Torrelavega’s European Super-Welterweight champ Sergio Garcia outclassing Ted Cheeseman at The O2 last month. Moreno, promoted by former Middleweight king Sergio Martinez, has only lost twice in a 23-fight career and has never been stopped. Hailing from Madrid, ‘Golden Boy’ has fought the majority of his career on home soil but insists he will not be intimidated by his former sparring partner’s home crowd. “I am not going to London for a holiday,” said Moreno. “This is the opportunity of a lifetime for me. We know each other very well having sparred on two occasions in the past. We’ve shared many rounds together and I think he knows that I will be too strong for him on the night. If his team thinks that this fight will be an easy defence for Charlie, they are very wrong. “I will follow the way of Sergio Garcia and Kerman Lejarraga. I’ve taken a lot of inspiration from my stablemate’s victory at The O2 last month and I’ll make Spain proud again when I lift the green belt above my head. Spanish boxing is in a very healthy position at the moment and it will be an honour to become my country’s next World Champion. The heavy-handed Liam Conroy is heading for Saturday’s dream British light-heavyweight title clash with Olympian Josh Buatsi full of confidence and ambition. Barrow-in-Furness’ Conroy (16-3-1-KO8) has blasted aside his last five opponents and although heading for the Copper Box an underdog, insists silencing doubters is an objective he’s a proven track record of meeting. Conroy said: “I’m feeling brilliant. I’m living the dream to be boxing for a British title. I’m so inspired and I think you’ll see an extra level to my boxing this weekend as a result of that. “The bookies have him a clear favourite. I was insulted at first but then I look back on times I’ve done this before – I’ve had brilliant wins being the underdog. “With it being on such a big scale and on such a big platform, it’s going to be even sweeter when I do it. “Having so many people from Barrow there will give me a massive push. I’ve sold loads of tickets even though it’s nowhere near London. I think they’re as excited as I am!